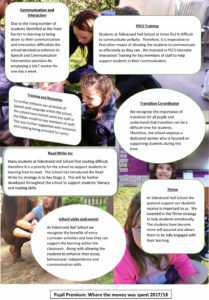 Please click here to read our SEN Information as part of the Norfolk Local Offer. We are required to demonstrate where our Primary PE and Sport Funding is allocated each year. The funding is in place to make “additional and sustainable improvements” to the quality of PE and Sport we offer, and how we encourage Key Stage 2 pupils to engage in Healthy, Active lifestyles. Pupil Premium is an allocation of additional funding provided to schools to support specific groups of children who are vulnerable to possible under achievement. These include pupils who are entitled to free school meals, those looked after by the Local Authority and the children of armed service personnel. All schools are required to report on the amount of funding received and how this is being used. It was first introduced in April 2011, since then the amount schools receive has increased. Schools will receive funding based on the amount of pupils who have been eligible for free school meals at any point in the last 6 years. The impact of the funding should also be reported. For the academic year 2017/18 Sidestrand Hall School received £88,720. We received a total of £67,320 (71 (students on FSM pupil premium) with an additional £21,400 for our children in care 10 LAC/PLAC). 61% of students at Sidestrand Hall are entitled to pupil premium spend of which 12% are looked after children. To review the spending of Pupil Premium an audit took place of the barriers to learning for these students; this focused the spending to address the areas of particular need. Impact is evidenced via achievement data and progress in reading is particularly strong. The literacy and numeracy catch-up premium provides schools with an additional £500 for each Year 7 pupil who did not achieve at least level 4 in reading and/or maths at the end of key stage 2. Maths and Literacy resources, including puppets, animal counters, word games, ICT programmes and apps etc. We will continue to explore ways to invest this money, based on the needs of these pupils. The object of the Charity is to raise funds to increase opportunities and enhance the education of the pupils at Sidestrand Hall School, either individually or as a group. It is not for day to day running expenses. Monies raised last year was used to purchase a new playground, the Library bus, various workshops, theatre groups, and other smaller projects and activities throughout the school. 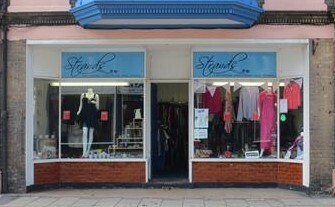 The Strands Charity Shop, in Cromer, opened in January 2013 and is a major fundraising stream for The Strands Charity. It also provides pupils with a valuable resource and using the shop is incorporated into the curriculum for Independent Living, Literacy, Numeracy and other aspects of pupil learning. We currently have 8 volunteers who work at the shop, as well as Sidestrand staff who dedicate time to making it a success. Donations for items to be sold can be taken directly to the shop or sent into the school.